WHEN YOU HIRE THE RODEO BULL YOU WILL ALWAYS RECEIVE A TOP QUALITY BUCKING BRONCO SET UP WITH ALL THE FOLLOWING FREE ITEMS – WE PRIDE OURSELVES ON WHAT WE DO! Alan here is a Barn Dance caller so can put a Package together for you if required. Looking at holding a Western Theme Party ? then you have come to the right place. 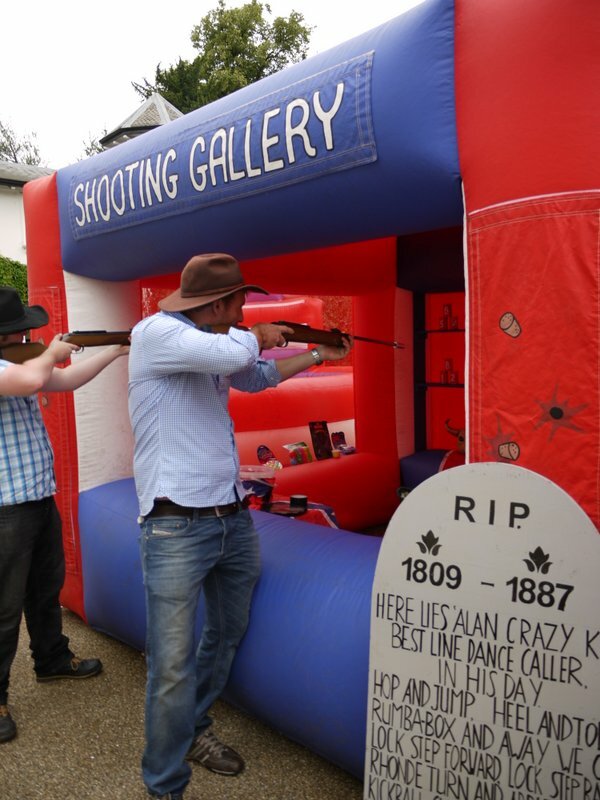 We have a large selection of Western Theme Props for Hire to make your Cowboy Party a real success. Barrels, Wagon Wheels, Flags, Western theme decoration, Cacti, John Wayne & Saloon Bar Cut outs (Standees), Corn Sacks, Horse Shoe Throw, Western Theme Games. The Surf Simulator in – MIDDLESEX, Barnet, Harrow, Enfield is great entertainment to hire for all age groups. See how long you can stick on the Surf Board while it bucks, rocks & rolls around until you are wiped out onto the Inflatable. The Surf Board is great fun for Hawaiian Parties, Beach Parties, Surf Parties, Corporate Parties, Military Parties, Fetes and Birthday Parties. The Surf Simulator is supervised by an experienced mature operator and has 10 levels on the Controls so can Cater for all abilities from beginner surfer to the more seasoned surfer. HAWAIIAN PHOTO SHOOT AREA WITH PROPS AND HAWAIIAN PICTURE FRAME. + COCONUT & PINEAPPLE SHY 30 COCONUTS/ PINEAPPLES MANNED , ALOHA FRONT ENTRANCE, WOODEN HAWAIIAN STAND UP SURF HUT, HAWAIIAN TOTEM POLE, HAWAIIAN LIMBO, LARGE LUAU PARTY SIGN, WOODEN PAINTED SURF BOARDS, 4 X DECK CHAIRS, SAILORS WHEEL, TRESURE CHEST, SECOND TIKI BAR, ADDITIONAL 20FT BY 10FT HAWAAIN BACKDROP, UPLIGHTING X 8 – FOR A NICE AMBIENCE AROUND THE PARTY AREA. Photos of all riders + various other pictures (sent to you via a simple link after the event – I am a keen photographer/work with a good quality camera and will take as many pics as possible at your event in-between running the Surf Simulator. The Surf Simulator & Hawaiian Props looks fantastic, various Hawaiian Scene Setter areas, Beach & Hawaiian Backdrops, Tiki Bar, Surf Picture Area, Limbo Bar, & Hawaiian Cactus Hoopla were just amongst some of the props and games supplied. There was a Hawaiian Picture area with Totem Pole and Hawaiian Picture Frames so everybody could get their picture taken + a games area outside which included Side Stalls the Shooting Gallery, Coconut Shy, Tin Can Alley & Wild West Hit the Jackpot. The Hawaiian Mariachi Band and the Rock Band were Superb and the guests danced the night away. The Impressive Hawaiian Props with up-lights, Surf Simulator and Tiki Hawaiian Surf Backdrop created a great ambient Hawaiian/Beach Themed feel to the function room. If you would like to Hire a Rodeo Bull Package or Rodeo Reindeer for an Xmas Themed Party with Side Stalls and Props we have the vast experience and expertise between our Team to help you arrange a very successful Event. We are happy to answer any questions you may have 7 days a week so please feel free to ring or e-mail us any time. The equipment we provide is always in fantastic condition, upmarket and clean and the Operator is always Smartly Dressed to Impress. At every Rodeo Reindeer/ Rodeo Bull Party we will Supply Pictures of all the guests on the Reindeer/ Bull + a free Marquee will be supplied if the Party is outside. Why not hire one of our Impressive Side Stalls and make your Party unforgettable – All our Side Stalls are to the Highest Quality and run by our Smartly Dressed Friendly Operators – We have two heights of Side stall 8ft and 9ft which can be used indoors or outdoors and work off a 1kw blower/ Standard 220/240 Volt 13amp Plug Socket. We have various lengths of extension leads that can be used. Think you are a Super Sharp Shooter? This is the Ultimate in Cork Shooting Gallerias. Upmarket and very Impressive otherwise known as a Shooting Range, Firing Range or Cork Gun Shooting Side Stall. An excellent addition to the Rodeo Bull Hire that can be used Indoors or Outdoors– at various events including Western Themed, Corporate, Fun Days, Military Events etc. or just hire the Shooting Gallery on its own. The idea is to shoot down the bottles, cans, and various targets with our Very Impressive Top of the Range BSA Gamo Cork Shooting Rifles which have been professionally converted so they shoot the corks accurately and powerfully. The Cork Shooting Side stall is run by our Professional staff member who will guarantee 100% safety and will take participants through how to load the corks in the Guns & shoot down the targets etc. Win a prize and impress your friends!!!!!!!!! . This stall is run by our Professional staff member – A fun game which involves trying to knock all the Western Tins down with the Sacks Provided and balls to win Western Prizes – 20 prizes Provided – Western Theme Gun Sets, Teddy Bears etc.. The Candy Floss & Popcorn Side Stall is extremally popualr at various events and includes various flavours and Colours of Candy Floss and Salt and Sugar with the Pop Corn.The Candy Floss & Popcorn Side Stall is extremally popualr at various events and includes various flavours and Colours of Candy Floss and Salt and Sugar with the Pop Corn. This stall is run by our Professional staff member – A fun game which involves Spinning the wheel and trying to Hit the correct Numbers to win prizes Provided – Western Theme Gun Sets, Teddy Bears etc..
Hit The Jackpot & Cactus Hoopla Side Stall is extremely popular at various events and the aim of this game is to throw the sacks throw the holes to win Prizes and throw the Hoops over the Cacti arms to win prizes. 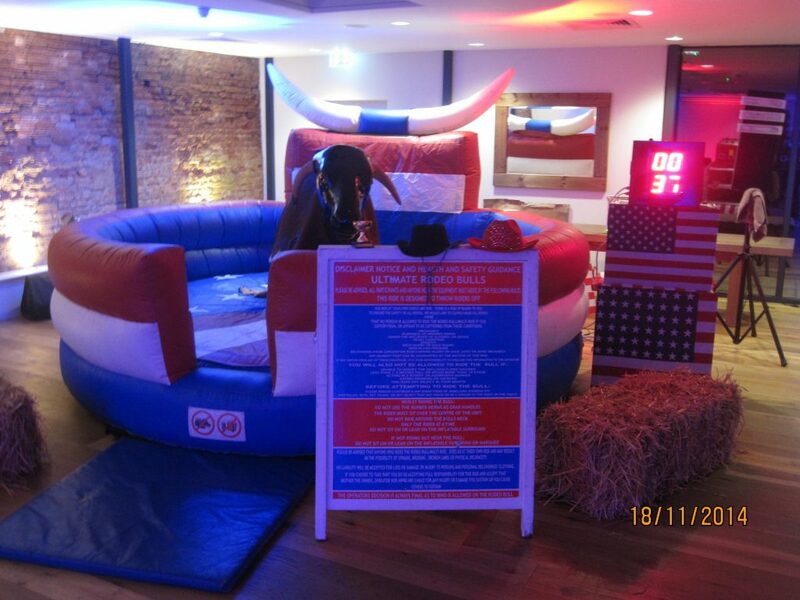 This stall is run by our Professional staff member – A fun game which involves having 10 Hoops and tring to Hoop them over the Cacti arms to win prizes – – Western Theme Gun Sets, Teddy Bears etc..
You will receive a Contract to secure your booking when booking a Rodeo Bull Event with rodeobullsdirect.co.uk. WE ALSO OFFER FULL SIZE BLACKJACK AND DICE/CRAPS TABLES AND THE WHEEL OF FORTUNE + A SELECTION OF 20 FT WIDE BACKDROPS INCLUDING LAS VEGAS,WILD WEST SALOON, JAMES BOND & HOLLYWOOD. So how much is the Fun Casino to hire- We Cater for a Variation of Party Packages from just the Standard Roulette & Black Jack Tables but you may also wont to Include a Large Western Themed Party with Props Hire, Side Stalls, Country Music, Instructed Line/ Barn Dancing and a Wild West Disco maybe to finish off. We are happy to answer any questions you may have 7 days a week so please feel free to ring or e-mail us any time. The equipment we provide is always in fantastic condition, upmarket and clean and the Croupiers are always smartly dressed to Impress.